There are few things as wonderful and natural as tea. It is amazing that the tea plant produces all varieties of tea, it is the cultivation method and the preparing of the tea leaves that provides each tea with its unique, distinct flavour. Though it will never be truly known where the tea plant, Camellia sinesis– originated, the earliest recorded use of the plant to make tea was in China. The vibrant, evergreen shrub is indigenous to the hillsides of Ceylon (Sri Lanka), China, India, Indonesia and Malaysia (Joliffe, L., 2003). Today it continues to be grown and manufactured in these countries as well as in the United States, Kenya, Japan and Argentina. C.sinensis var sinensis : Mainly grown in China, it produces small leaves with many stems. When pruned it can grow between 1-3 meters, whereas in the wild it can grow upward of 8-20 meters. This variety of tea shrub produces a delicately flavoured and aromatic tea and can live for hundreds of years. C. sinensis var. assamica : Mainly grown in Assam, this variety of tea shrub produces a strong earthy flavour from a small single-stemmed tree with large leaves. When pruned it grows no more than 1 meter in height and can only live for around 40 years. C. sinensis var. cambodiensis : Mainly grown in Cambodia, this variety is a hybrid of the other two varieties (Saberi, H., 2010). It is grown for its foliage and seeds instead of its flowers and fruit. 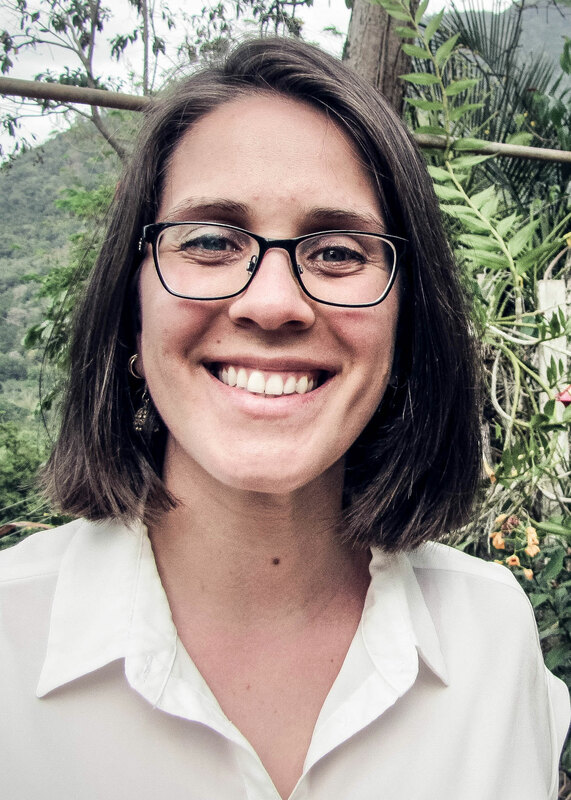 New tea plants are either grown from a seed, which some believe results in a plant that is more nutrient dense and stronger or by cloning another tea plant. Such a method (plant hybridization) results in a much faster maturation and allows the tea grower to choose more favourable characteristics from the parent tea plants (Gayland, L., 2015). This single plant makes numerous types of teas which are all dependent on regional differences (and secondly on the processing and fermentation methods). The natural factors that influence the flavour characteristics of tea leaves are; climate, altitude, soil quality, air quality and exposure to sunlight (Gayland, L., 2015). 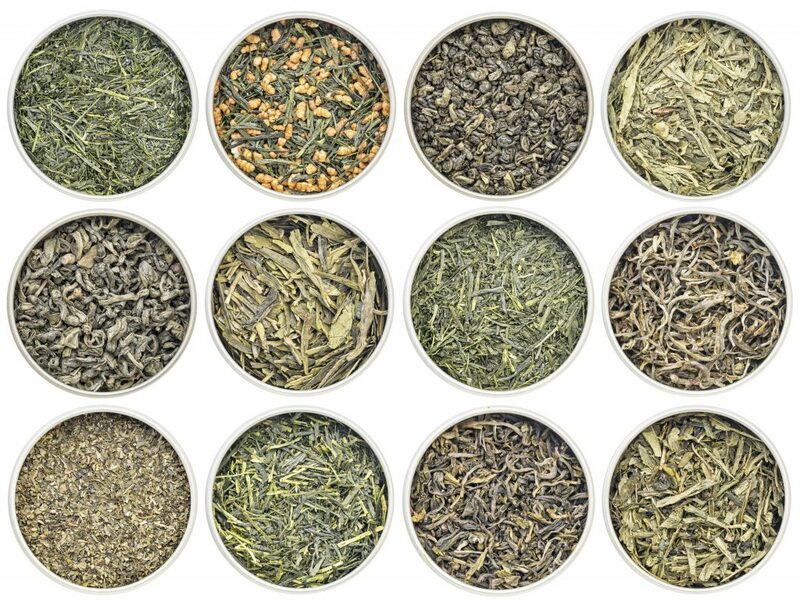 There are six basic types of tea; green tea, yellow tea, dark tea (brick tea and Pu-erh tea), white tea, oolong tea and black tea. Teas such as green tea are unfermented, black tea on the other hand is. The fermentation of tea is the “oxidative polymerization and condensation of catechins catalyzed by endogenous polyphenol oxidase and peroxidase” (ed. Ho, C.T., Lin, J.K., & Shahidi, F., 2009, page 2). The legend of the first cup of tea varies among East Asian cultures. In China, it is said that Emperor Shen Nung (2737-2697 BC) chanced upon tea accidentally as he was boiling himself some water. A few leaves from a nearby evergreen bush drifted into his pot of hot water and after a few moments released a wonderful aroma. Shen Nung tasted and was soon invigorated by this mysterious beverage (Campbell, D., 1995) (Saberi, H., 2010). This first documentation of tea as a beverage was in 1200 BC, where tea was served to King Wen of Zhou. (Campbell, D., 1995). During this time in China tea was mainly used as a medicine and if drunk at all, was mainly done by nobility and Buddhist monks. However, the most reliable account of tea is from the year 350 AD, where tea and its processing and drinking is referenced in a Chinese dictionary (Ukers, W., 1935). The Szechwan Province of China is where tea production began around 350 AD. It was during this time that the demand for tea grew and as such so did its production. Chinese tea producers would cut down whole tea shrubs, some of which grew upwards of 30 feet. At this point in time they had not learnt how to cultivate the tea shrub and soon enough this destructive method was thrown aside for a more primitive form of cultivation. By studying the wild tea plant they were able to see and mimic the environment tea plants needed to grow. With the seeds, they began to harvest in the late fall and early winter months mass cultivation of tea ensued (Ukers, W., 1935). In the 6th century AD, China and its people began to see tea as far more than a medicinal drink. It began to influence poetry, art and religion (Ukers, W., 1935). In the year 780 AD Lu Yu a Chinese Buddhist scholar wrote Ch’a Ching or Tea Memoir, a three-volume description of how tea was grown, harvested, produced into tea and drunk. This three-volume depiction of tea introduced the rest of the world into what was and continues to be the luxurious world of tea (Campbell, D., 1995) (Ukers, W., 1935). 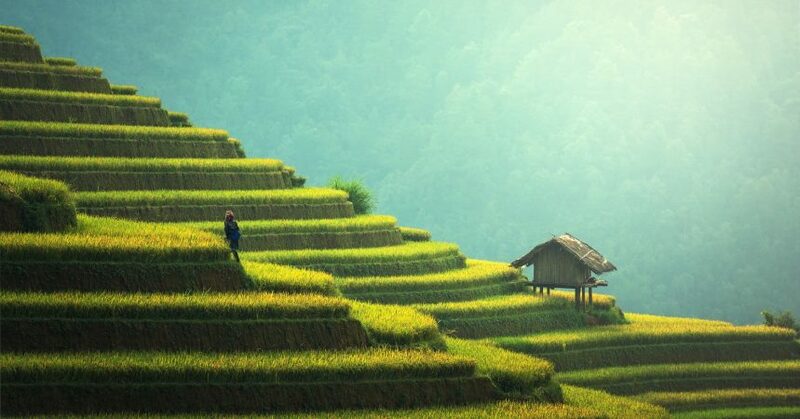 Tea production and consumption, had at this time already spread all across China, making tea an incredibly important resource so much so that tea leaves which were processed to be stored as bricks or cakes were also used as currency. During the Sung dynasty (960-1280 AD) dried tea leaves began to be ground down into a very fine powder – called Matcha (Matsu Cha) or ground tea. These finely powdered teas would be whipped lightly with hot water using a bamboo whisk. This processed allowed the Chinese to move past adding salt to tea, as the powdered tea leaves proved to be very flavourful on their own. (Ukers, W., 1935). Just before Lu Yu wrote the Ch’a Ching, tea was presented to the Japanese Emperor Shomu as an official gift from China around 727 AD. This flavourful beverage was well received and for a short time, its consumption spread across Japan royalty and priests. Instability within Japan and its relationship with China stopped major trade and the growing of tea ceased until 1191 AD when a Buddhist monk by the name of Yeisai (Senko-Soshi) reintroduced Japan to tea (Campbell, D., 1995). Tea had fallen out of favour in Japan and so when Yeisai brought it over it was mainly used by Zen Buddhist monks as a medicine as well as a way to keep themselves awake during long sessions of meditation (eds. Varley, P., & Kumakura, I., 1989). Apart from bringing back tea seeds – which he planted on the slopes of Mount Seburi – and aiding in the flourishment of tea cultivation Yeisai wrote the first Japanese tea book named; Kitcha Yojoki (Campbell, D., 1995) (Ukers, W., 1935). As tea was previously restricted to priests and nobility this book allowed for a widespread knowledge and appreciation of tea (Ukers, W., 1935). In the 16th century in Japan Sen, no Rikyu a tea master to Oda Nobunaga, developed the art of the tea ceremony in Japan. This custom was established for the upper classes of Japanese society, mainly for men, as well as Bushi and wealthy merchants. Later on he published a book “Chanoyu” or The Way of Tea, which depicted the methods, etiquette and practise of the tea ceremony as well as utensils and bowls that were to be used (eds. Varley, P., & Kumakura, I., 1989) (ed. Willson, K.C., & Clifford, M.N., 1992). 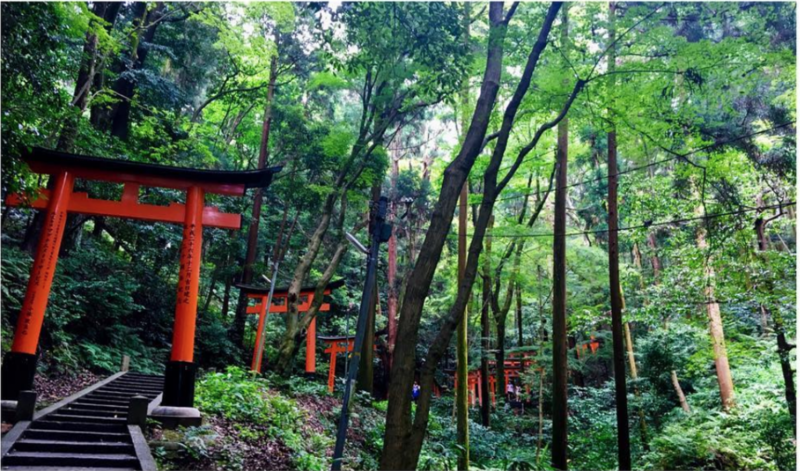 Through the influence of Chanoyu, the cultivation of tea plants changed in Japan. The Uji province near Kyoto began to cultivate their tea under the shade of rice straw as it was seen to improve the quality of ceremonial green tea or matcha. When Dutch traders began trading from China’s Java port in the Province of Fujian they learnt the Amoy word Ch’a (tea) which was ‘te’ (pronounced tay) and they took it with them to Europe (Chow, K.B., & Kramer, I., 1990) (Saberi, H., 2010). It is also the Dutch who win the favour of the Japanese during the Edo Period a time when Japan had secluded itself from the rest of the world. In 1610 they were the first to introduce Japanese green tea to the western world, specifically the Netherlands (Campbell, D., 1995). Though there is only one tea plant, green tea must be made of the variety C. sinensis var sinensis as the other two variants of the tea plant have high very high flavonol levels and would result in a bitter tea. Tea plants that make green tea are higher in amino acids, particularly the variety that makes matcha. (ed. Willson, K.C., & Clifford, M.N., 1992). The processing of green tea is subdivided into two distinct processes; steamed and pan-fried. Both methods ensure the prevention of fermentation of the leaves. The steaming process is mainly conducted in Japan, whereas the pan frying method is done in China. Most of the green tea available on the market, especially teas simple labelled “Green Tea” are from China and are processed using the pan-frying method (ed. Ho, C.T., Lin, J.K., & Shahidi, F., 2009). Anji Bai Cha (from Zhejiang Province, China): This Chinese green tea is sometimes referred to as a white tea, due to its pale yellow/white colour which is a result of a lower chlorophyll count. Often called Sparrow Tongue (due to its unique curved shape) it is rich in amino acids and polysaccharides and gives off a sweet, tangy and delicate flavour. 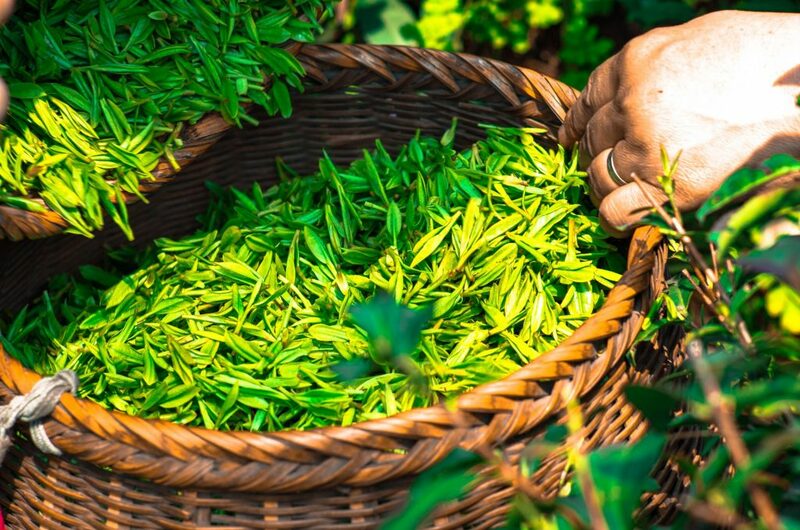 Long Jing (from Zhejiang Province, China): Called Dragon Well tea, it is a gently sweet, yellow-green tea, with a high amount of l-theanine in it (which gives it with its sweet taste). Dry roasted by hand provides the tea with its unique shape. Pingshui Gunpowder: Also know as green pearl tea or gunpowder green tea, this small pellet rolled tea is dark green in colour and high in antioxidants. Easy for travel as it keeps its aroma for a longer time as a result of its shape and processing methods. Gyokuro: Shade grown for 20 days and as with Tencha and Matcha only the new shoots are picked from the tea shrub. It is a dark green colour, high in chlorophyll and amino acids which provide it with its sweet taste. Sencha: This type of green tea is most favourably drunk, globally and within Japan. It is steamed, rolled and the end result is crude tea; which can have its form changed depending on the manufacturer. Matcha: Made from ground tencha tea leaves. 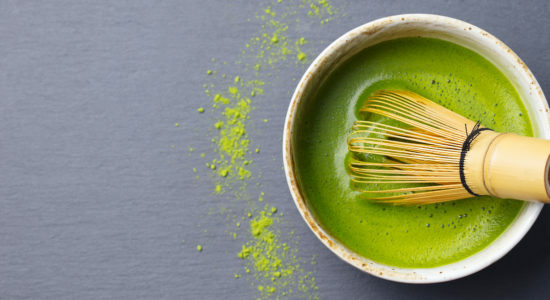 Dark coloured matcha is called Koicha and is the matcha that is traditionally used for the Japanese Tea Ceremony. The leaf is fully consumed in the tea. Fukamushi Sencha: This type of green tea is steamed twice as long as regular sencha resulting in a more powdery tea leaf, which is stronger in flavour and of a deeper green colour. It is more nutrient dense than other loose leaf teas as a result of its powdery form. Kabusecha : This tea is only shade grown for one week prior to harvesting, it is dark green in colour as a result of the chlorophyll that develops in it over the short time it is shaded. This tea is a mixture of two processing methods Sencha and Gyokuro. Tencha: Mainly used for the making of matcha green tea, tencha is made by shade growing using the gyokuro method. Genmaicha: This form of green tea also contains roasted and popped brown rice and sencha green tea, making it a lower caffeinated tea. Has a light, nutty flavour. Hojicha : Made from roasted sencha tea leaves. The leaves are roasted again at a temperature of about 200C, this causes some of the caffeine to evaporate resulting in a less bitter, lower caffeinated tea. 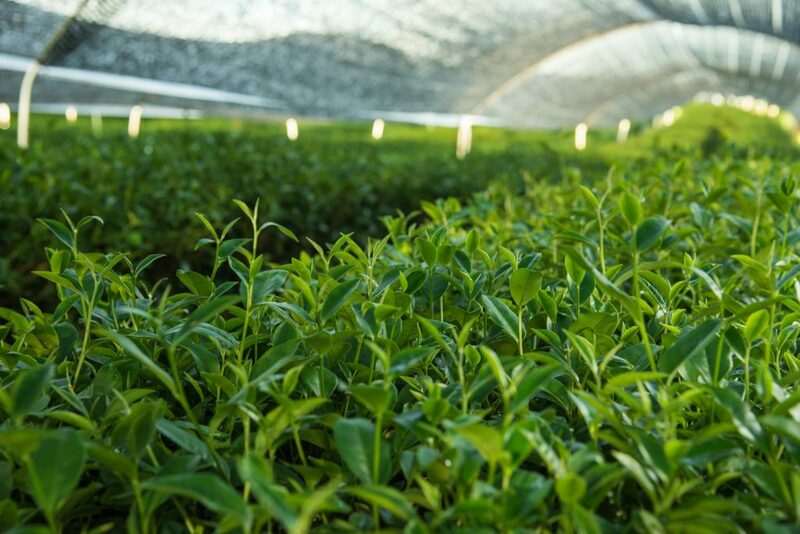 Green tea production involves no oxidation or fermentation of the tea leaves, resulting in a fresh and aromatic, nutrient and essential oil dense tea. As all teas come from the same plant there is a very specific way that green tea is made to ensure the vibrant, subtle sweetness and light bitterness of this glorious and healthy tea. Not all green tea is shade grown, Gyokuro, Tencha (which makes Matcha) and Kabusecha are shade grown. Kabusecha requires only one week of shade cover before the tea leaves are plucked, whereas for the proper development of Gyokuro and Tencha/Matcha a far longer time is required. Tea Shrub growing under shade. The shading of the tea plants begins around late April when the first leaf opens on the tea bush, from which point they will be covered by either rice straw or marsh reeds (traditional practice) or a modern nylon mesh (ed. Willson, K.C., & Clifford, M.N., 1992). For between 1-2 weeks the tea plants are covered eliminating 40-50% of sunlight, after that for a following 2 weeks, the plants are shaded so that 90-98% of sunlight is removed. This shading process plays an incredible roll in the quality, flavour and nutritional content of green tea (ed. Ho, C.T., Lin, J.K., & Shahidi, F., 2009). After 20 days of growing under intense shade the leaves are ready to be plucked; either by hand or machine (ed. Willson, K.C., & Clifford, M.N., 1992). This first plucking of tea leaves in the first harvest, the second harvesting of tea leaves begins 40-45 days later, a third harvest is also done (often resulting in culinary grade Matcha as well as lower grade teas for commercial use) 40-45 days after the second harvesting (Greenfield, B., 2014). Not all green tea is shaded, which does not make it less beneficial, simply the secondary plant compounds in shaded versus not shaded green tea will be different. Shading forced more chlorophyll to the tops of the shoots of the outermost leaves of the tea bush, resulting in more nutrient dense and vibrant coloured leaves (ed. Willson, K.C., & Clifford, M.N., 1992). 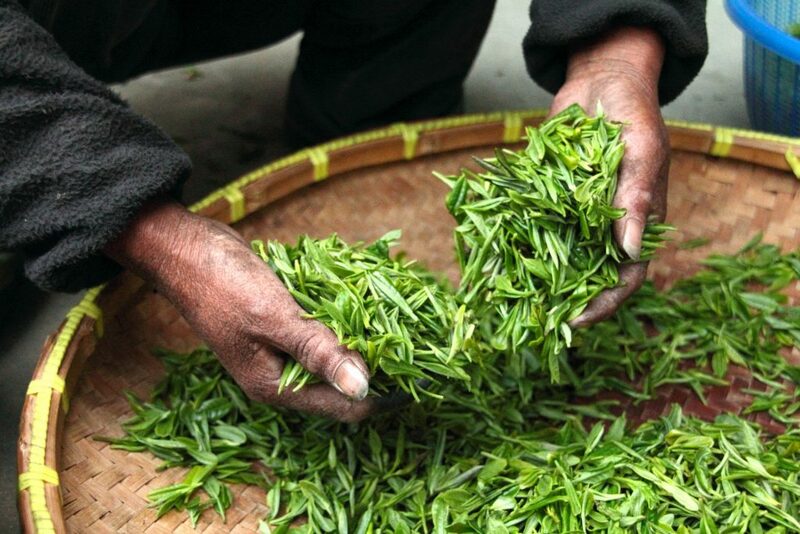 Green teas during harvesting have different requirements; some only need the shoot with one bud and two leaves to be picked, whereas green teas of higher quality will require for only one bud and one leaf to be picked, some requiring only the bud and no leaf (ed. Ho, C.T., Lin, J.K., & Shahidi, F., 2009). To prevent fermentation of the picked plant the tea leaves are immediately sent to a manufacturing plant to be fixed by the process of steaming or pan frying/drying, ensuring the inactivation of the endogenous enzyme (ed. Ho, C.T., Lin, J.K., & Shahidi, F., 2009). It is at this point that there are variations between Japanese and Chinese green teas. Japanese green tea will be steamed – though there are practices that pan fry as well – meaning the leaves will run through a high heat steam. This can be done at either a small level by placing the leaves in a wicker basket over a steam bath or at an industrial level where the leaves are steamed in a spinning vat. Sometimes, larger companies will also clean the leaves prior to steaming (ed. Ho, C.T., Lin, J.K., & Shahidi, F., 2009). After the steaming process, the leaves are left soft and malleable, allowing them to be rolled and slightly cooled. The leaves are then taken to be fried/dried by various means resulting in different variations of green tea. All will have a moisture content of approximately 6% or less (ed. Ho, C.T., Lin, J.K., & Shahidi, F., 2009). Some forms of green tea will also require the extraction of the stems and veins of the tea leaves after the drying/frying portion of tea making. Once de-veins and de-stocked the leaves are placed on a shaker to ensure that only the best parts of the leaves are kept. A few companies, after the steaming and drying, is completed will send the leaves into cold storage if they are not ready to process them yet. This results in a fresh nutrient dense product year round. If this is not done then the dried leaves – now called Tencha – that had just been steamed, dry roasted and de-veined proceed to be ground down into a fine powder called Matcha. The grinding process is done on a stone mill, often times now the tencha tea leaves are ground on a high-grade automated granite mill. The mills move slowly, gently releasing the tencha to be ground down into matcha. The reason the process is so slow is that high heat at this point will deteriorate the quality of the tea, affecting the aroma, flavour and nutritional constitution. The final product, matcha green tea powder, is ground down to approximately 5 microns (ed. Willson, K.C., & Clifford, M.N., 1992). Many Japanese tea companies will have a Tea Master in their employment, who will provide grading for the tea dependant on colour, texture, smell, taste (the umami of the tea) and feel. Instead of steaming the leaves the Chinese go right into dry roast/fry the freshly picked tea leaves in copper basins or giant panning machines at very high heats (Saberi, H., 2010). This process began around the 14th century and is named the Kamaira cha process. Right after the harvest, the tea leaves are heated at a temperature of between 250-300C for between 10-15 minutes, all the while being shaken so as to not allow the leaves to burn. This dry roasting/frying process prevents fermentation and allows the nutrients to stay within the tea (ed. Willson, K.C., & Clifford, M.N., 1992). The Chinese roasting process develops a pan-fried aroma which is distinct to their variety of green tea. After the high heat roasting is completed the leaves are shaped into three distinct styles of Chinese Green Tea; Ball/gun types, twisted – Chun mee or Sow mee, as well as flat leaf. After the shaping of the leaves, they are roasted yet again for 10-15 minutes in a roller at a temperature of between 100-150C. 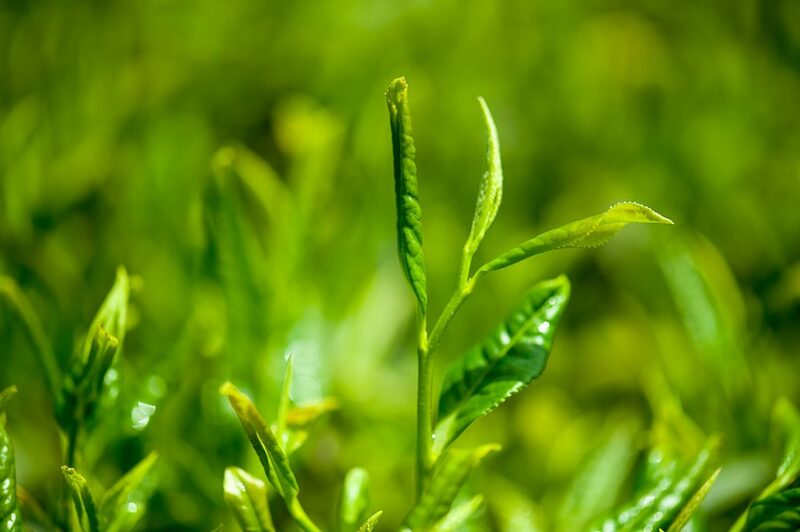 The flat leaf variety is later polished or ground down like Japanese Tencha into a powder, making imperial green tea (if the tea comes from the first harvest or Qing Ming – The highest grade of Chinese tea). Because the tea is not steamed and is simply roasted the colour of the polished tea comes out as a pale green, nonetheless nutrient in the ground green tea leaves remains unchanged (ed. Willson, K.C., & Clifford, M.N., 1992). The list of green tea benefits is extensive. Different varieties of green tea will have variations of vitamins and minerals as well as other nutrients. Green tea is a good source of vitamin A, E and K as well as chromium, potassium, magnesium, zinc and selenium (Chatterjee, A., Saluja, M., Agarwal, G., & Alam, M., 2012). However, although it is lower in vitamins and minerals – especially when the whole leaf is not consumed, green teas are a phenomenal source of amino acids, antioxidants and other secondary compounds as well as varying nutritional constitutions. Green tea is very high in phenolic compounds, such as phenolic acid, flavonoids and tannins. Phenolic compounds are the plant’s protection against stressors and display strong protective actions within the human body as well. These compounds have strong antioxidant, anticarcinogenic, antimutagenic and anti-inflammatory actions on the body. Flavonols are abundant in green tea, they account for approximately 30% of the dry weight of a green tea leaf (Chatterjee, A., Saluja, M., Agarwal, G., & Alam, M., 2012). Epicatechin, epigallocatechin, epicatechin gallate and epigallocatechin gallate are all potent flavonols found in green tea, the latter of which, also known as EGCG is the most favoured for its health benefits (ed. Willson, K.C., & Clifford, M.N., 1992). They aid in the prevention of cancer and cardiovascular disease (Graf, B.A., Milbury, P.E., Blumberg, J.B., 2005). Essential Oils are most predominantly found in teas of early harvest such as Ceremonial Matcha and Sencha (ed. Willson, K.C., & Clifford, M.N., 1992). Amino Acids are also plentiful in green tea, primarily in shaded green teas such as Matcha, Tencha and Gyokuro, which are especially high in l-arginine and l-theanine (ed. Willson, K.C., & Clifford, M.N., 1992). Vitamin C (ascorbic acid) deteriorates green tea. The shading process used in Japan for various forms of green tea results in a lower count of vitamin c which allows the tea to withstand oxidation longer. In order for the lower the amount of vitamin C in unshaded green teas such as sencha high-temperature roasting diminishes the likelihood of oxidation, however, it locks in nutrients and flavour (ed. Willson, K.C., & Clifford, M.N., 1992). Chlorophyll this wonderful substance is what allows plants to be green. It aids in building healthy blood, protects against cancer and aids in wound healing. It is a potent antioxidant and is alkalinizing. Chlorophyll is most potent in green teas that are shade grown, as the chlorophyll in the tea plant moves to the top leaves (Holford, P., 2009). 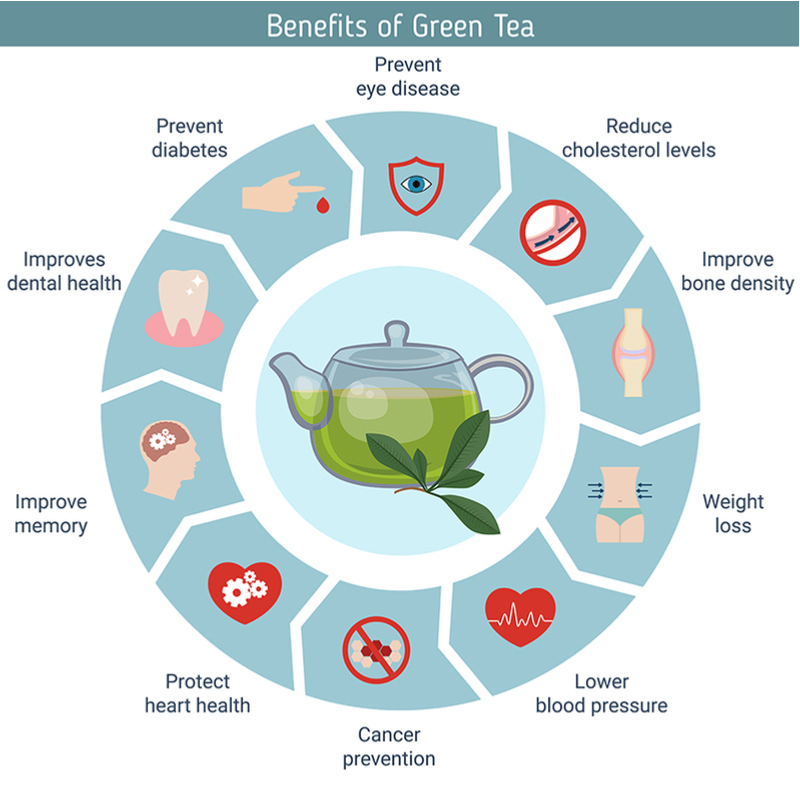 Green Tea in all its varieties has numerous health benefits, which individuals can benefit from at any age. This superfood is easy to incorporate into one’s lifestyle and a joy to drink. The phenols and antioxidants in green tea are what make this drink a superfood. 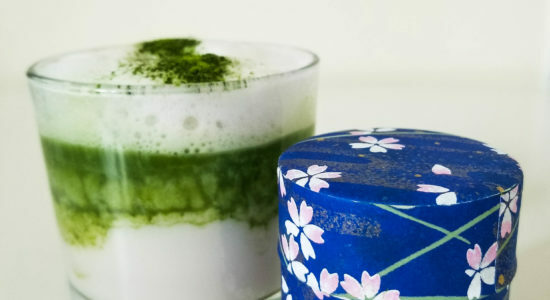 Matcha, due to the consumption of the whole leaf as well as its high catechins content contains approximately 137 times more EGCG than common green tea and 3 times more than the best quality loose leaf green tea (Weiss, D.J., & Anderton, C.R, 2003). Many of the studies done on the benefits of green tea look at loose leaf tea, therefore if three cups of tea are far too much one can simply consume 1 cup of ceremonial grade matcha and for best results consume 2-3 cups a day. It has been shown through numerous studies that the consumption of 3 or more cups of green tea can decrease the recurrence of various forms of cancer; particularly breast cancer, stomach cancer, prostate cancer. Three (3) cups of green tea contain between 240-320 mg of polyphenols – a plant secondary compound that provides anti-cancerous effects for the body (Murray, M.T., & Pizzorno, J., 2012). This precancerous condition, which involves abnormal cell growth in the lining of the cervix or endocervical canal and the second leading cancer to cause death in women worldwide. The consumption of green tea, especially ones high in EGCG and polyphenol E been some to prevent the occurrence of cervical dysplasia, by reducing the HPV infection and preventing the formation of a tumor (Zou, C., Liu, H., Feugang, J.M., Hao, Z., Chow, H.H.S., Garcia, F., 2010). The consumption of green tea has been shown to protect against the development of Parkinson’s disease (motor neurodegenerative disorder) as a result of the polyphenol content in the tea. EGCG and other polyphenols in green tea have been shown to possess both neuroprotective and neuroregenerative capacity which directly interferes with the aggressiveness of the disease (Murray, M.T., & Pizzorno, J., 2012) (Caruana, M., & Vassullo, N., 2015). Having and maintaining healthy gums is a critical part of having and maintaining a healthy body. There are numerous ways to improve gum health, drinking green tea is one of them. Drinking green tea regularly reduces inflammation of the gums, aid in the diminishment of bad bacteria within the mouth, promotes good gum health and aids in the prevention of future diseases within the mouth. 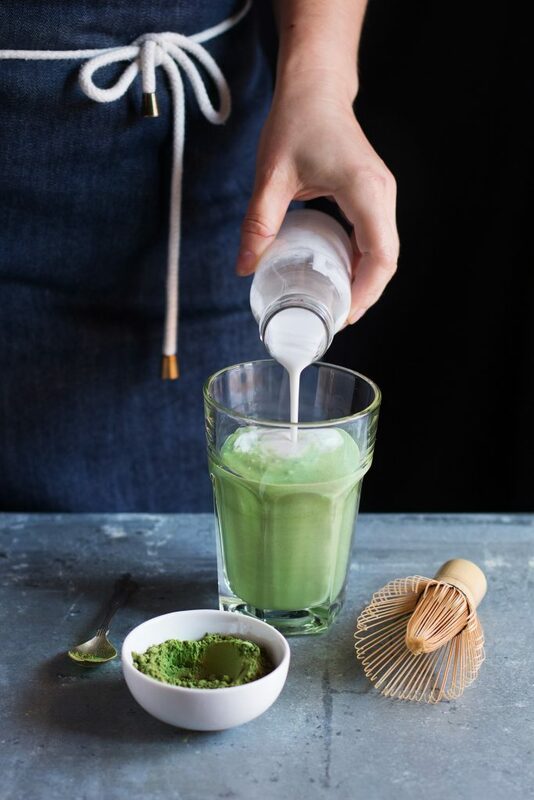 3-5 cups a day or 2-3 cups of matcha will aid in the prevention and maintenance of good periodontal health (Chatterjee, A., Saluja, M., Agarwal, G., & Alam, M., 2012) (Murray, M.T., & Pizzorno, J., 2012). Green tea has been shown to be protective against osteoporosis. Being a good source of Vitamin K and a great source of polyphenol E and EGCG has been shown to restrict bone resorption as well as stimulate osteoblast activity (Murray, M.T., & Pizzorno, J., 2012). To obtain such benefits 3-5 cups of loose leaf green tea are recommended. aids in weight loss by preventing the metabolism of norepinephrine as well as inhibiting the actions of hypertrophy and hyperplasia which have a negative effect on gastric enzymes necessary for nutrient uptake. Immune system boost due to high antioxidant count, anti-inflammatory compounds and phenols and flavonoids. Campbell, D.L. (1995). The Tea Book. Louisiana: Pelican Publishing Company. Caruana, M., & Vassallo, N. (2015). Tea Polyphenols in Parkinson’s Disease.Adv. Exp. Med.Bio. 863:117-37. Online Available atPubMed. Chatterjee A, Saluja M, Agarwal G, Alam M. Green tea: A boon for periodontal and general health.Journal of IndianSociety of Periodontology. 2012;16(2):161-167. Online Available atPubMed. Chow, K.B., & Kramer, I. (1990). All The Tea In China. San Francisco: China Books and Periodicals, INC.
eds. Ho, C.T., Lin, J.K., & Shahidi, F. (2009). Tea and Tea Products Chemistry and Health – Promoting Properties. New York: CRC Press. eds. Varley, P., & Isao, K. (1989). Tea in Japan. Essays on the History of Chanoyu. Honolulu: University of Hawai’i Press. eds. Willson, K.C., Clifford, M.N. (1992). TEA: Cultivation to Consumption. North Yorkshire: Springer-Science + Business Media, B.V.
Gayland, L. (2015). The Tea Book. New York: Penguin Random House. Graf, B.A., Milbury, P.E., Blumberg, J.B. (2005). Flavonols, flavones, flavanones, and human health: epidemiological evidence. J.Med. Food. 8(3):281-90. Online Available at PubMed. Greenfield, B. (2014). Beyond Training. Las Vegas: Victory Belt Publishing, Inc.
Holford, P. (2009). The Optimum Nutrition Bible. Great Britain: Piatkus. Lipski, E. (2012). Digestive Wellness. United States: McGraw-Hill. Saberi, H. (2010). Tea: A Global History. London: Reaktion Books. Ukers, W.H. (1935). All About Tea. New York: The Tea and Coffee Trade Journal Company. Weiss, D.J., & Anderton, C.R. (2003). Determination of catechins in matcha green tea by micellar electrokintic chromatography.J Chromatogr A. 1011 (1-2): 173-80. Online Available atPubMed. Zou C, Liu H, Feugang JM, Hao Z, Chow H-HS, Garcia F. Green Tea Compound in Chemoprevention of Cervical Cancer.International journal of gynecological cancer : official journal of the International Gynecological Cancer Society. 2010;20(4):617-624. Online Available atPubMed.